I have observed that just the name of Jesus evokes tremendous reactions in our culture. No other name sparks debate, arouses hostility, or engenders great devotion like the name of Jesus. It is a curious thing if you stop and really think about it. Why is it that the name of Jesus increasingly met with such passion and controversy. People love to hate Tim Tebow because he relentlessly proclaims his love for Jesus to the world. Why? Military chaplains are currently instructed (at least in the US Air Force where I serve as a reserve chaplain) to refrain from using the name of Jesus in public prayer. Why? I've watched in my lifetime the name of Christ removed from Christmas. In my small town the banners attached to the light poles along Main Street read "Happy Holidays", "Peace on Earth", and "Noel." I've noticed other biblical allusions, but nowhere can I find the word Christmas. Why? I suspect because it contains the name Christ, which, of course, is Jesus. Maybe you've noticed this in your town too. Even an unbeliever, who rejects the claims that Christianity makes about Jesus, should find the omission of Christ from Christmas and the hostility to Jesus curious. I mean really, either you believe in Jesus and go to church and all that religious stuff or you don't. If you don't why would you care if others do? If you choose to reject the message of Christianity personally, then why object to those who do accept it or to traditions and celebrations that obviously are rooted in it? Neither is one forced to believe in Jesus, nor one is punished for not believing. So why all the intolerance for the name of Jesus? The answer to the question depends greatly on your point of view. A non Christian person may genuinely think that if the name of Jesus or symbols of Christianity occupies any part of the public square, then it is being forced on them. The so-called politically correct person may simply want to sanitize that public square for any perceived favoritism toward any one religion. The secularist may simply want no religious expressions at all in the public square. A religious person, like a devout Jew or Muslim, may simply feel that they are being run over by the religious majority. There can be no doubt that the prominence that Christianity once held in our country has faded. Many past assumptions that kept Christianity mainstream simply aren't there anymore. At one time the vast majority thought nothing negatively about Christian public prayers, displays of the Ten Commandments, or nativity scenes and crosses on public properties. But in the last half century or so much has changed. Our culture has become increasingly tolerant of every kind of lifestyle, behaviors and obscenities and increasingly intolerant of of anything specifically Christian. Now before you think that I'm just whining and pining for a return to the good old days, let me interject this. I'm just stating an obvious trend in our American culture. But even as I do so, I'm excited about the opportunity for the gospel and for the church. I know historically that in the darkest times is when individual Christians have shined most brightly. Today, is a great day to proclaim the gospel of Jesus Christ. Paul wrote to the Romans, "For I am not ashamed of the gospel, for it is the power of God for salvation to everyone who believes..."(Rom. 1:16) Here we see why someone like Paul would suffer and strive for the gospel of Jesus Christ. He knew that people's salvation depended on it. Therefore, he would not listen to critics, tolerate false teaching, or back away from its message for a second. It might irritate me that the culture has shifted and that Christianity doesn't hold the sway over traditions like it used to. I might sigh a little and wish that it were different. But a symbol, monument, decorations, or public prayer never saved a person's soul. However, there is a person by whom all persons who believe can be saved - Jesus. Under serious threat of persecution Peter boldly declared Jesus as legitimate and said, "And there is salvation in no one else; for there is no other name under heaven that has been given among men, by which we must be saved" (Acts 4:12). Many people don't like the exclusive claims of Christianity. They don't like being informed that their ways are wrong. I think we can understand that. Who likes being told their wrong about anything? I believe that this is why we are told to "speak the truth in love" in Scripture. If people's natural pride is going to bristle at being told they are wrong, that they need to repent of sin and that they need to die to self, it might help if we delivered that message with genuine love and compassion. It does nothing for the gospel to return hostility with hostility or intolerance with intolerance. Our response must always be love. Even as our culture may become more increasingly belligerent toward Jesus, we need to be falling more deeply in love with Jesus and the gospel. If we do this, then we can love our enemies and pray for those who attempt to do us harm-just like Jesus told us. And a life that demonstrates this is of infinite more worth for the gospel than any symbol or tradition. There is no other name than Jesus by which people can be saved. Therefore, I want people to see Him through me - by my proclamation, by my testimony and by my life. Frankly, I don't care what the culture around me thinks or does. I can't control how much or how little society reflects my Christian convictions, but I can be passionate about the gospel, which has the power to transform lives first - then a whole culture. What do you get when you take four evangelical Christians with a blend of academic expertise and pastoral experience and pose the simple question: What has been the relationship between Christianity and the United States of America? Well, one thing you get is some differing opinions. Hopefully, the chief product is a thought-provoking discussion about our American history and the degree of impact the Christian faith has had on American culture and ideas. 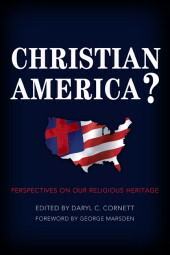 This new book, Christian America? Perspectives on Our Religious Heritage, ought to be on book store shelves now. Besides myself (pastor and former teacher) other contributors include David Barton (historian and founder of Wall Builders Ministries), William Henard (pastor and teacher), and Jonathan Sassi (teacher). In addition, I was thrilled that George Marsden (American Christian historian extraordinaire)consented to write a foreword for the book. What a privilege to have such a renowned scholar give his time and efforts to endorse and help promote this work. He's also an incredibly nice guy. I believe this discussion about American identity is important today. Our country has experienced dramatic change in its collective attitude toward Christianity. Everywhere you turn it seems that the old assumptions of Christian belief and custom are being torn down and met with increasing intolerance. And I think it is understandable that many sense these changes, which begs several relevant questions. How have we gotten to this present state of affairs? How did it used to be? What kind of ideas was this country founded on? What has been the role of religion in the public arena? How do we go forward from where we are? This work consists of four chapters, each with a different perspective concerning how Christianity has informed our American culture and politics. At the end of each chapter, the other three writers offer short responses. In this way, the book is more like a conversation, and at times a quite spirited one! However, the discussion always remains respectful in spite in significant disagreement. I'm grateful to Broadman Holman for making my idea for a book into a reality. In no way do I think that this work offers any definitive word on the subject. It probably raises more questions for the critical thinker than provides answers. But I think that is a good thing. This book is designed to help the reader consider the subject and examine different arguments and interpretations of American history. If you do decide to put it on your reading list, I hope you consider it time well spent because it made you think more deeply. I hope particularly that teachers and students will find it a good tool for discussion, critical historical analysis and in what ways Christians can engage their culture. This past Sunday morning I challenged our parents to stand boldly this basketball season for God. I hope that they received this challenge in the spirit of love with which it was given. Frankly, I am jealous for their devotion to God. It breaks my heart to watch families erect a new sports idol with each coming season. Around here there are two main patron deities of sports pantheon - baseball in the spring and summer and basketball in the fall and winter. Football is a close third little god. Right now we are at the beginning of the round ball season. Let me give you a little background. Last year I led our church and local churches to sign a petition asking a neighboring county to start its Sunday basketball games no earlier than 2 pm. During basketball season this facility holds tournaments practically every weekend and on Sunday. (the week's end is Friday and Saturday, Sunday is the beginning of the week - I hate it when people include Sunday as part of the so-called "week end.") I digress. Anyway, the number of signatures collected was disappointing. But even more disappointing was so many of my fellow pastors who chose not to lead their congregations to participate. Thanks to the few who did! I also called the judge executive who is in charge of the county run and operated sportsplex. He answered my request with contempt and hostility. Honestly, I was shocked at his response and his lack of professionalism as a public servant. He was belligerent and illogical in his argument. Now, here we are a year later. I can see that appealing directly to those who might accommodate families who want to be in church will not work. Actually, that's okay. The only question for me and all Christians is this: Will I honor God with my choices no matter what everyone else is doing? I should not expect this world to cater to my spiritual priorities or even understand them. However, I can firmly fix my priorities to the glory of God and to teach my children what is most important. I like sports. I played sports, and I follow some sports. I enjoy a ball game on TV when I get the chance, and I enjoy our local schools' games. My son plays sports, but from day one we told him that sports takes a back seat to God and family. I've challenged my parents again to put a fence of protection around Sunday morning. I've told them without equivocation that they and their kids should be consistently in Sunday school and worship on Sunday morning. I regret that our world has so little regard for the Lord's Day that it schedules basketball games on Sunday morning and early afternoon. But the power to choose is with the parents, not the leagues or the coaches or the sportsplexes of America. Parents must sit down with their children and help them to realize what is most important and then teach them by doing what is most important. I tell our parents that they are constantly teaching their kids how to prioritize their lives. The question they need to answer honestly is what are the priorities they are modeling. I'm praying that some moms and dads, who profess to be committed to Christ, will have the boldness to swim against the stream of culture and allow their kids to miss a few basketball games for God. I'm tired of watching parents, who are professing Christians, bow down to a game and sacrifice their children on the alter of sports. I'm grieved to watch families come to church during sports seasons only when there is no conflicting game. I'm sick in my soul to watch church families habitually choose sport over God when the choice presents itself. It's time to repent of our idolatry and tear down the sports idol and smash it into pieces! It's time to put God first and not just give Him the leftovers. It's time to decide what is truly most important and live it.